At the VMAs, which were broadcast from New York City’s Barclays Center and reached more than 10.1 million viewers, fans were treated to a thrilling rendition of Mars’ new single, "Gorilla". Dressed in a leopard skin shirt on a stage awash in green lasers and gorilla imagery flashing on a massive LED screen, Mars delivered a memorable, soulful vocal performance through a Sennheiser SKM 5200-II wireless transmitter and MD 5235 capsule. During the VMAs, which also featured performances by Justin Timberlake, Kanye West and others, Mars picked up two Moonman awards: Best Male Video for his #1 hit single "Locked Out of Heaven", and another for "Best Choreography" for his latest single, "Treasure". The VMAs were the icing on the cake for Bruno Mars’ production team, who has endeavored to continually raise the audio quality and production standards of the touring operation for the past several years. Sennheiser’s global relations team has played a direct role in helping them achieve this goal by providing superb wireless and microphone technology. "When I took on the Bruno Mars gig over 2-1/2 years ago, he and the background singers were using a competitor’s model. I just knew there was a better microphone and capsule combination for him," recalls James Berry, monitor engineer for Bruno Mars. "I began transitioning the background singers first, then worked with the front-of-house guy to get Bruno to try a Sennheiser microphone. Now you couldn’t pry that microphone out of his hands if you tried!" he says. For wireless audio at the VMAs, as well as with the rest of the tour, the Bruno Mars production team has relied on Sennheiser. At the VMAs, one particular challenge was the massive LED walls at the rear of the stage. "We had to shoot the wireless signal right through the LED walls," Berry recalls. "We did a lot of pre-planning on antenna placement when we got there. It was all rock solid and performed flawlessly." The monitor crew used Sennheiser’s WSM software to save set-up time: "We used WSM to preload all the frequencies we were sent, so when we arrived, we just booted up the system and were ready to go in about ten minutes. In the past, we would have had to go to every individual unit and program all this information in." Berry also used the software to monitor each wireless element in real time: "I rely on WSM to see my battery and RF levels, as well as all the inputs and outputs," he says. 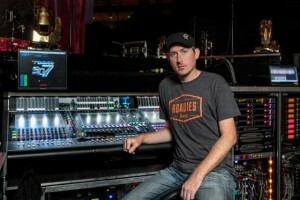 Derek Brener, who has been Bruno Mars’ front-of-house engineer for 3-1/2 years, recalls a point where Bruno’s audio infrastructure took a huge step forward: "One of the main turning points was when James came in and said he would not use anything else but the Sennheiser wireless ­ that’s when everything changed. James is such a heavy hitter having worked with Beyoncé, Weezer and lots of other great bands, I trusted his opinion." After trying various Sennheiser capsule and transmitter combinations for some time, Berry and Brener eventually settled on an SKM 5200 handheld transmitter with an MD 5235 capsule. 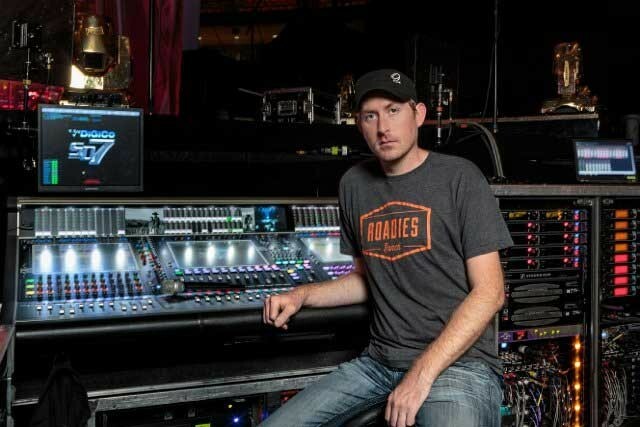 "For me, the MD 5235 capsule punches through the PA system better than any other microphone we’ve used on Bruno Mars," says Brener. "Bruno is very involved with Derek and me on the way things sound and has very clear ideas on what he wants and what he expects," Berry adds. "Now, it is a comfort thing. Whether we are playing arenas, stadiums or awards shows, there is no debating ­ he wants Sennheiser, and that’s what he’s going to get." For vocals and horns, the band’s wireless consists of ten channels of Sennheiser EM 3732-II receivers, seven SKM 5200-II transmitters with MD 5235 capsules and three SK 5212-II bodypack transmitters. Berry says that one of the primary reasons they chose the EM 3732-IIs was because of the AES3 digital output with external word clock synchronization: "We are clocking our wireless devices at 96kHz to get the best sound quality we can. We didn’t consider anything other than this unit because we knew it would give us the best sound quality and reliability on the RF side." "For me, clocking at 96kHz opens everything up so it sounds more full," Berry continues. "You have the entire frequency expanse in there, and what you put in is what you get out. Therefore you can hear the Sennheiser MD 5235 microphone capsules we are using with even greater fidelity." The band also relies on Sennheiser for its wireless monitor systems, of which Berry has sixteen channels of SR 2050 IEM. This covers the entire band, as well as off-stage technical staff. "I’ve used a lot of in-ear systems, and the reason I chose Sennheiser is because of sound quality," says Berry. "The wireless IEMs deliver a wide stereo image so I can put things right into place where they need to go in my mix. For me, there is no other option than the 2k series because of that." All in all, over the course of the entire North American tour including the VMAs, the Sennheiser equipment has performed flawlessly, reports Brener: "We have never, ever experienced a drop out as long as we have had the Sennheiser wireless. It is all rock-solid. I have major confidence in Sennheiser."